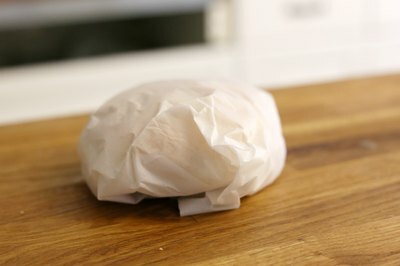 With their simple yet distinctive taste and classic waxed paper wrapping, McDonald's hamburgers have delighted patrons since the 1950s. Now, with literally billions sold in restaurants around the globe, McDonald's burgers are an institution in their own right and a symbol of American culture. That famous McDonald's taste comes from a blend of seasonings and a precise method for cooking and assembling each burger. And while you won't be able to make an exact replica in your own kitchen, you can get pretty close to the real thing. Separate your pound of chuck into 10 balls. On waxed paper, flatten each ball until it is about 4 inches in diameter and 1/4-inch thick. 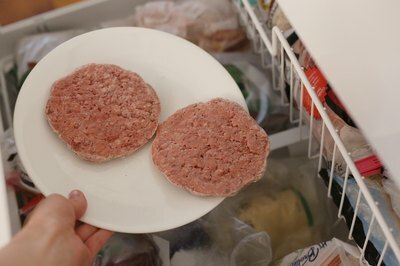 Transfer your patties to the freezer and freeze for 1 hour. Microwave your diced onions for 45 seconds on High. This will soften and warm them slightly. 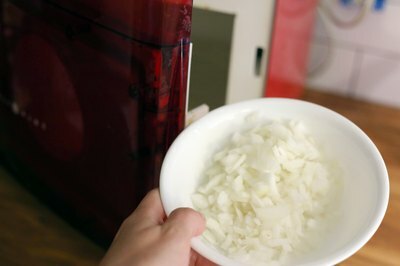 If you use dried onions, reconstitute them by placing them in a plastic container with enough water to cover and storing them in the refrigerator until your hamburgers are cooked. 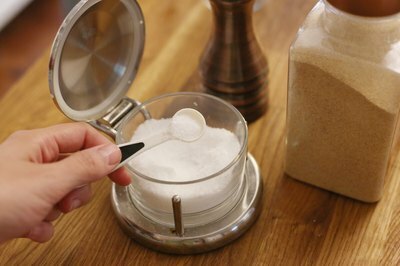 Measure your salt, MSG, pepper and onion powder into your seasoning shaker. Screw on the top of the shaker, cover the holes with a piece of waxed paper, and shake vigorously to mix. This is your seasoning. 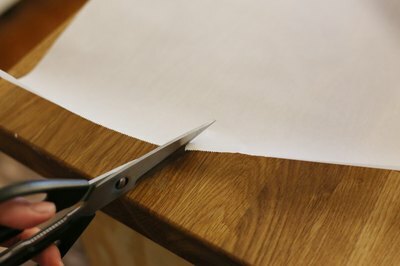 Cut 10 12-by-12-inch sheets of waxed paper, using your scissors and ruler. Lay aside. 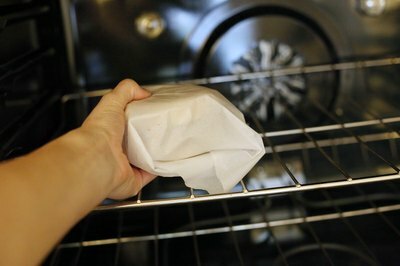 Preheat your oven to "Warm" or "Keep Warm." 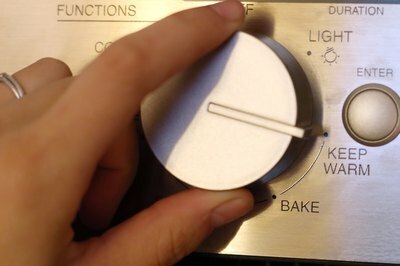 If your oven does not have this setting, preheat it to 170 degrees Fahrenheit. You'll also preheat your griddles. On one you'll cook the hamburgers, and on the other you'll toast the buns. 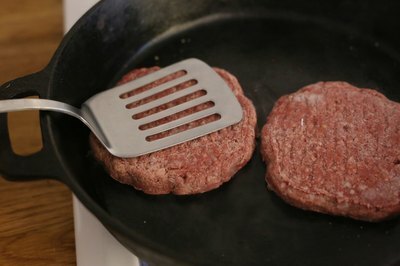 Set the hamburger griddle to 375 degrees and the bun griddle to 350 degrees. Take your frozen patties out of the freezer. 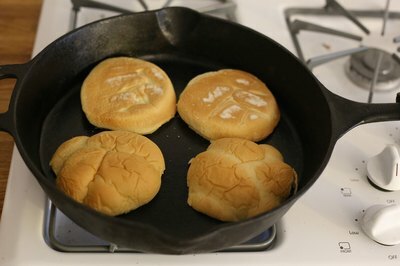 Place the top halves of four buns (more if your griddle will accommodate them) on your bun griddle. After 30 seconds, remove the tops -- they should have a golden brown color -- and repeat with the bun bottoms. Lay aside and turn off your griddle. Lay 3 or 4 frozen patties on your meat griddle. After 20 seconds, press each patty with your spatula to sear them, then sprinkle generously with your seasoning. Wait 1 minute, turn your patties, and add another dash of seasoning. Spoon 1 tsp. of your microwaved (or reconstituted) onions on each patty. Spread the onions in a circular motion on each patty with the back of your spoon. Remove hamburgers from the griddle after 1 more minute. Repeat in batches until all your burgers are cooked. Lay aside on your large plates and turn off your griddle. 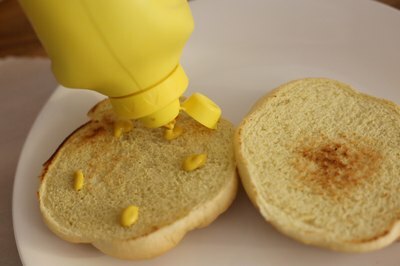 Squirt 5 small dots of mustard and 5 slightly larger dots of ketchup on the top half of each bun. Place 1 slice of pickle in the center of the bun. 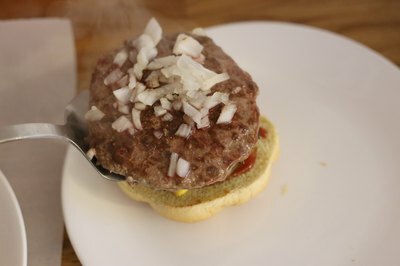 Place each hamburger onion-side up on the top half of a bun, using your spatula. Place the bottom of the bun on top (your burger will be upside-down). Repeat for all 10 burgers. Place a sheet of waxed paper in front of you, inside up, in the shape of a diamond. Place a finished burger upside-down in the center. Fold the 4 corners in to the center of the burger, and flip the wrapped burger right-side up. Repeat with all 10 burgers. Place your wrapped burgers in your preheated oven for 8 to 10 minutes. This step replicates the heat lamps at McDonald's. Have all of your ingredients handy and premeasured, since the hamburger cooking time is only about 2 minutes total. The faster your hamburgers are prepared and wrapped, the fresher they'll be. Exercise caution around hot electric griddles. 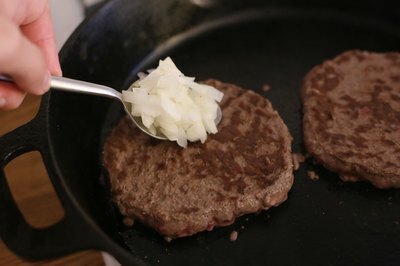 Learn how to cook venison hamburgers with tips on adding fat, flavoring the meat and garnishing the burger.